Some Christmas presents for the mail-lady, the UPS delivery man, the lady down the block and so on. Nice, very nice. You are a good Santa’s helper. You have been busy, Eric! Thanks for the how-to link. Great assortment of Christmas presents Eric! I’m sure everyone will enjoy them. No wonder you were so silent lately. 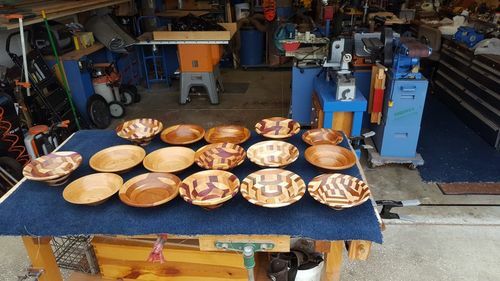 Those are great turnings and make great gifts. I can frankly say that you now master this technique. This is very inspiring. Thank for posting. Now I have to check if my scroll saw tilts ! Very nice bowls and even greater gifts for the lucky ones!! Wow Eric, your friends and neighbors will be delighted with these gifts. They are beautiful!! This is a wonderful collection of bowls and you did a fine job on them. They will make wonderful Christmas gifts.